Comedy Dynamics announced that it has acquired Bad Vegan and The Teleportation Machine,which will be released on iTunes, and On Demand on March 19, 2019. Bad Vegan and The Teleportation Machinefollows Lily, a struggling stand-up comic in NYC who falls for a guy named Spike, a childhood geek turned handsome physicist. Spike seduces her, spawning a whirlwind of insanity in which Lily aids in his obsessive pursuit to deliver the ultimate breakthrough in science the world has ever seen: Human Teleportation! The film’s director, Antón Goenechea has co-written two feature films with Mexican director Humberto Hinojosa: Paraiso Perdido, released in 2016 and Camino a Marte, released in February 2017. Bad Vegan and the Teleportation Machineis Anton´s first feature film as a director. The film was an official selection of the 2016 Woodstock Film Festival and the Brooklyn Film Festival. 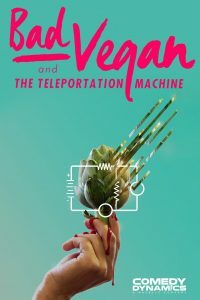 “Bad Vegan and The Teleportation Machineis one of those films that leaves you with a heightened sense of hope and belief, whether it be in yourselves or others.” said Brian Volk-Weiss, CEO of Comedy Dynamics.